"I told her, 'It's coming,' '' Kanaan said with a grin, referring to Danica Patrick's initial victory. "She knows exactly what I talked about. We all know it and we can't wait to shave her head." What - did you think I was going to quote Ed Carpenter's F-bomb live on the IMS Radio Network? Naaah. I'll bet Jeff a gallon of ethanol they don't shave her head, just cut her hair to shoulder-length-ish. 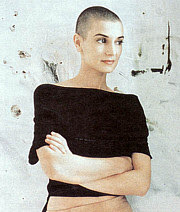 Danica will be on many, many, many TV shows after she wins and the Sinead O'Connor look won't work very well for her. I won't take that bet, if for no other reason than shaving her head would cause her thousand points of sponsorship to explode. Although come to think of it, I don't think she's hawking any hair care products. Weird.